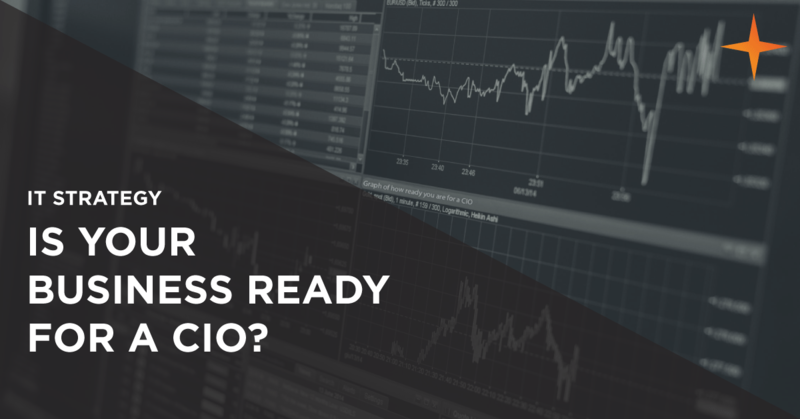 Is my business ready for a CIO? If you don’t know what a CIO is, or want a refresh, check out our existing article on the role of a CIO. Since it’s a complex role to explain, we won’t be covering it here. Does my business need a CIO? A widely held notion is that only large, multi-national corporations need the service of a CIO. This may have been true a decade or so ago, but with IT now central to the whole business it’s no longer the case. The skills of a CIO are now useful to any size or type of business from a 50 person legal firm to a 300 person manufacturing business. When there are plans to make a change in the business, a lack of data and information can plunge even a good idea into uncertainty. Lacking the knowledge for major IT-related business decisions results in project delays. And when the time does come to choose, it’s a decision made on the promises of salesperson rather than on proven facts. These factors often limit the scope and effectiveness of projects. Resulting in a lower value or poor performing outcome. A CIO helps by de-risking the decision-making process. By using their knowledge of technology and the wider business, they can find a solution which has its base in hard facts and proven performance, rather than going by guesswork and hope. The CIO also gives an amount of certainty to making IT-related business decisions. This can help drive change and adoption, giving you an edge over your competitors who may be uncertain about how to review and apply new technologies such as AI or initiatives such as process improvement and automation to their business. When one system or department’s poor performance and operations restricts the ability of another department to get work done, animosity and frustration can arise. This friction is often made worse by siloed departments. This causes rifts of communication, priorities and strategy to form and makes employees feel like they are fighting against their co-workers to get work done. By being a mediator who ties together the IT and operations sides of the business, a CIO can help reverse this friction. Producing a unified strategy and operating environment means employees will be working towards a complementary outcome. And since everyone will be working in tandem, the likelihood of bottlenecks forming is also reduced. Finally, because the CIO is in a neutral position, not aligned to any specific department they can be an impartial judge over which department is in the most need of IT resources and systems. By relying on the facts and listening to each case, they can determine whose requests and priorities to address first. Rather than having each department claim they are in the most need. When constant IT issues are occurring, employee performance will decrease. For a 40 employee firms, even 5 minutes of disturbance per employee per day wastes over 16 hours a week. A CIO will listen to the complaints being made and use their knowledge to identify and address the root of the problem. Be that through their own team, a service provider or a software vendor. This not only minimises employee’s frustrations but it also improves their efficiency. Making a difference to your bottom line. A CIO can also help you understand where issues might arise in the future as your business grows. They have the expertise and experience to know when you’ll meet friction and pain from an IT or operational standpoint. Allowing them to smooth out the road before you get there. When your business is experiencing change (moving premises, going through a merger or acquisition, moving to cloud, expanding teams, e.t.c.) there can be uncertainty around the potential threats which arise and unseen opportunities which pass by. Large scale change in the business’ use of IT can also create unease from a strategic standpoint. A CIO has the experience, skills and expertise required to get things done in this situation. And thanks to their knowledge of both IT and business, they’re able to take advantage of the opportunities and mitigate the threats which may arise during a period of change. When a business sees IT as a necessary evil, it’s inevitable that they’ll commit the least money, time and effort towards it. But businesses which do this only end up handicapping themselves since IT is not only ‘a cost’. It’s instead the main area where you can gain a competitive advantage in the modern business arena. The ‘IT is a cost’ mindset arose in the early 2000s due to a decline in business intelligence and a lack of understanding in what IT is. Investments were being made based on trends and hype, not fact. And when people were burned by their mistakes, it lead them to think of IT as a waste of resources. The CIO helps bring back the business focus and knowledge that so many businesses have lost. Allowing IT to once again become a performance enabler. Through wise technology investments, addressing deficiencies and ensuring that the IT strategy aligns with the strategy of the wider business, the CIO can re-kindle faith in IT and drive it back into the heart of the business, where true business gains lie. When there is no interest, there is no innovation. There needs to be someone in your business excited about the potential of IT to realise it as the driving force that it is. Without this momentum, you risk projects being put on the backburner or dropped altogether. Slowing your pace of innovation, or even causing stagnation. So in a world where you either innovate or go out of business, the CIOs interest and proven experience in technology is vital. By staying abreast of the latest trends and opportunities a CIO can ensure you’re always getting a business advantage. And with their understanding of the business applications of IT, new technologies and systems can deliver improved business processes and productivity. Giving you a competitive edge. How big of an investment is a CIO? If you’ve identified any of the above pain points as something you’re experiencing, you might now be interested in finding a CIO of your own. There are two ways you can go about doing this. The first is to hire a CIO and the second is to utilise a CIO service. Both options have their merits, but a CIO service is often the preferable route. Hiring an in-house CIO is a significant investment for smaller and many mid-market businesses. And with the role demanding technical and business knowledge alongside at least a decade of experience, talent is difficult to come by and keep. It also comes with a hefty price tag. A CIO’s salary is likely to eclipse that of any existing senior IT employees you already have such as an IT Director or Chief Technology Officer. It may also surpass many of your other C-level executive’s salaries as well. On average, you can expect to be paying ~£150,000 per year. And for a highly qualified candidate, up to £240,000 per year, almost a quarter of a million. If you’re unable to part with this much cash or are already concerned about cash flow, you may now be thinking that a CIO is out of reach. Fortunately, a CIO service is much less demanding in this regard. Because a CIO service has many clients, you get to benefit from the economies of scale which allows prices to be much lower on average. Combined with how you only pay for the time you use their consultancy, rather than a yearly salary, a CIO service will typically come out much cheaper than an in-house employee, all whilst offering the same benefits. This allows you to seize the opportunities a CIO offers without putting your business’ finances at risk. How should CIOs prepare teams for cyber threats? What does a Chief Information Officer (CIO) do?